There are currently flights available from Vancouver to Hawaii for under $375 CAD roundtrip including taxes. 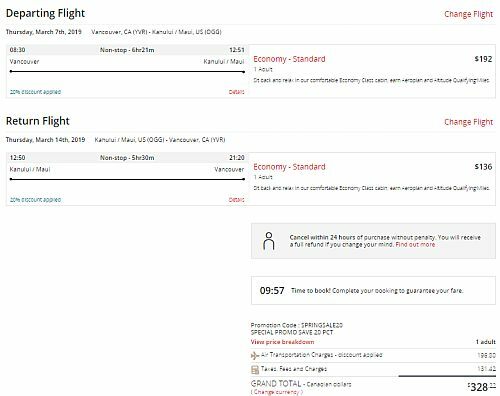 - Air Canada is showing a few flights in March and April 2019 for $328 CAD roundtrip, after applying a 20% off promo code. Start by using the Google Flights below, and look for the dates that are $372 roundtrip. Go to the WestJet promo code page. Enter coupon code: U77XF34 for 23% off base fares to Hawaii. Use the same dates you found on Google Flights. The code expires Feb 28 at midnight. Go to the Air Canada promo code page. Enter coupon code: SPRINGSALE20 for 20% off base fares to Hawaii. Use the same dates you found on Google Flights. Code expires Feb 28 at midnight. 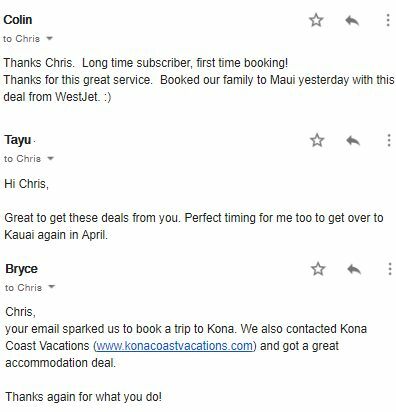 vancouver, yvr, flight deals, honolulu, hawaii, hnl, westjet, air canada, united states, kauai, lih, maui, ogg, kona, koa, united airlines, north america, kahului and the big island.